When I was younger I was very into collages. I would make them for everything I loved, bands, horses, flowers, I was a fiend with a glue stick. Recently, I noticed that collages have made a bit of a comeback in the adult world, but now we call them vision boards. I saw a friend’s vision board on her fridge and felt a rush of nostalgia for those glued up poster boards and I wondered how something like that could work with paint. Suddenly, my childhood and my adult world were colliding. 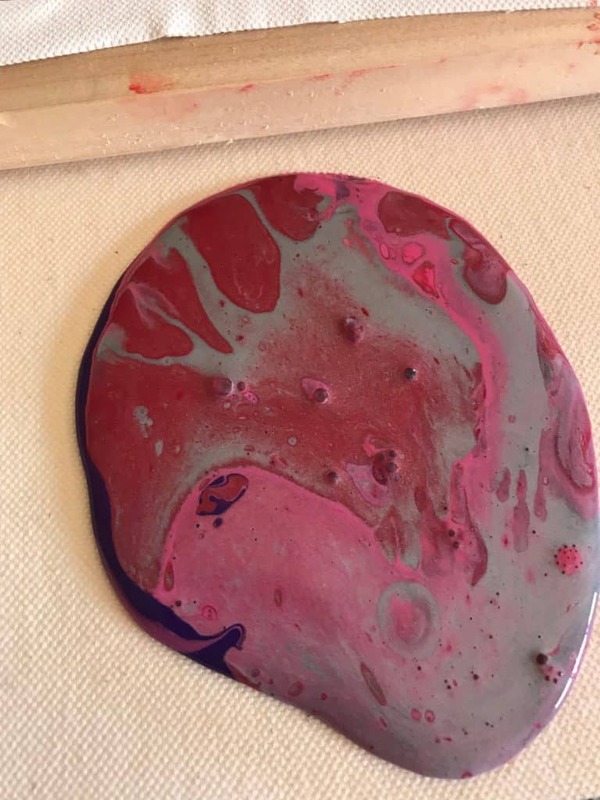 The last pour I did has plenty of room for more paint and the pattern I created I loved so I decided to build from there. 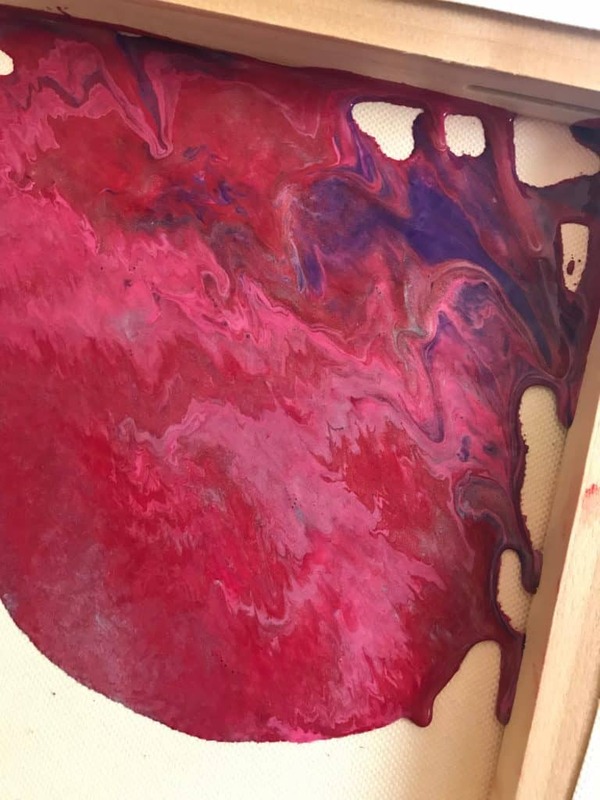 I took a look through my paint stores and tried to find a collection of colors that I don’t usually use but would work together and work with the colors already on the canvas. I settled on a warm color scheme with a little pop of silver to continue with my recent love of a touch of metallics. Because I was using pink and red I wanted to layer my colors so those didn’t just run together and become a hot pink. I decided to go with a classic flip cup this time, since getting back to basics was the name of this game. I wanted to give my past pour enough space that it wouldn’t be covered but close enough that I could start to fill up the canvas. 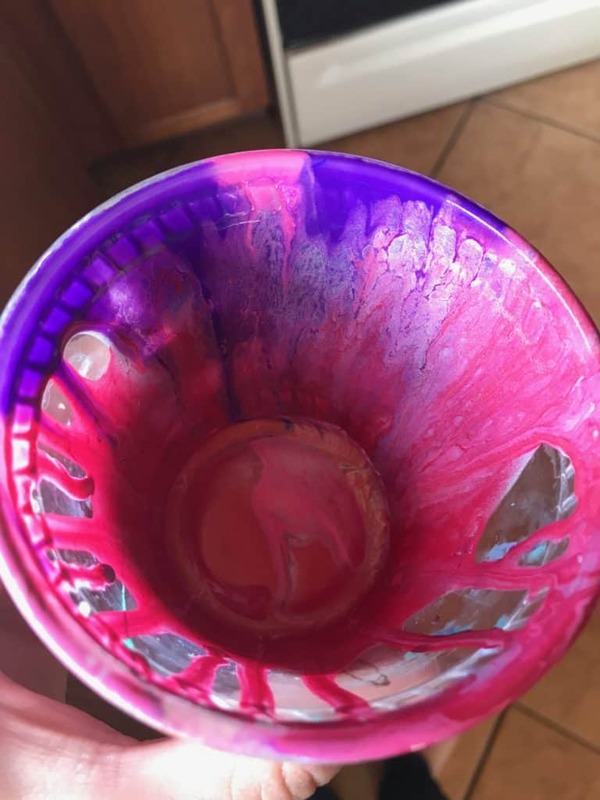 When I first lifted the cup it looked like the purple had been totally buried under my layers of purple. With some tilting I managed to get the purple to come through and fill up nearly the entire corner. The big clusters of silver that were on top of everything during that initial flip started to blend in to everything else once the tilting started, which was good because I wanted it as more of accent than a prominent color. I got some really cool ripples of the pink and red mixed in with the silver that. Even my pour cup turned out beautifully, but if you know me you know I love a good happy accident and always grab a picture of my pour cup. If I could just let my cups dry and keep them all to create some kind of crazy plastic mobile to keep over my dining room table, I think I would! I wanted to leave some gaps for future pours because I think I’m going to have a lot of fun with this long term project, and it’s a great chance to practice techniques. Time to start dreaming up some new color schemes to go into my next step of the collage! 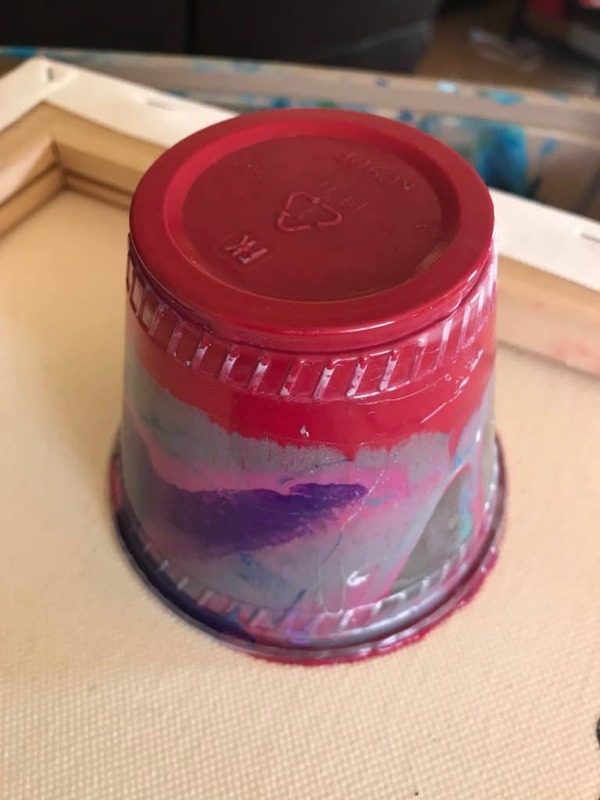 why do you pour on the back of a canvas? 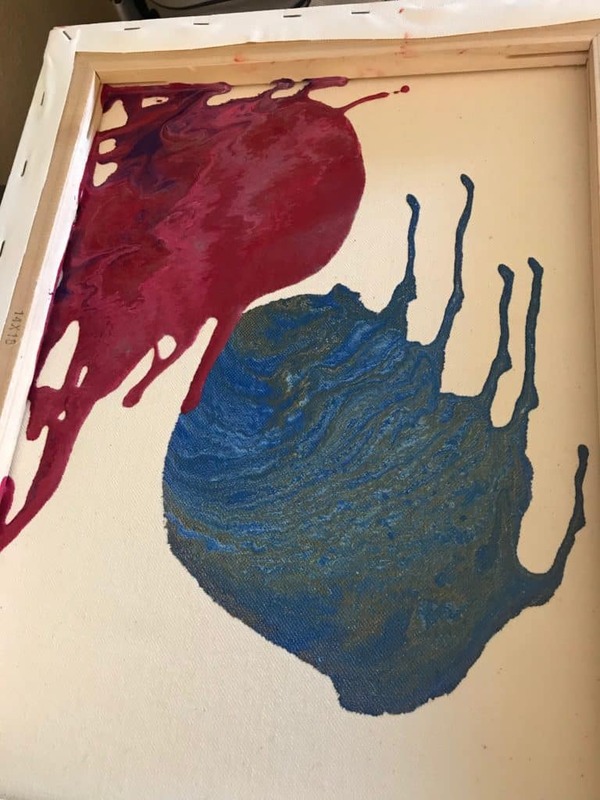 I’m not sure why the pour is on the underside of the canvas. OK, you lost me. 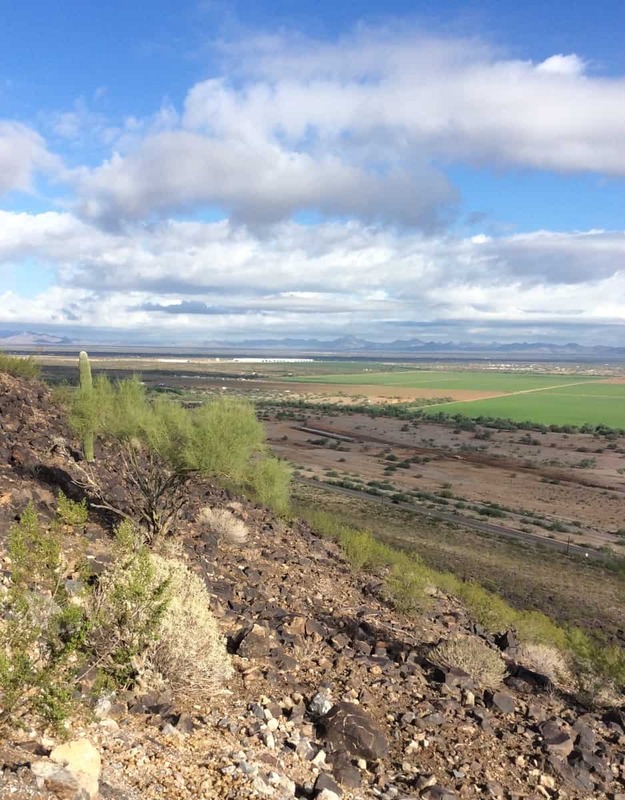 You’re pouring on the back of your canvas, so what’s the next step? Are you looking for the paint to show through on the front and you’re adding additional materials, or is this just to create skins to be used in a collage?